And now….for something a bit different! My 9 year old grandson Jeremy has always been interested in tools, and making/fixing things. 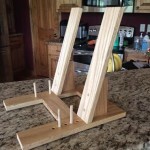 This year his birthday present was a woodworking class with Grandpa. Each Tuesday we get together and work on projects. 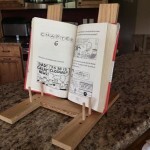 His first was an adjustable book holder. At the same time, we started working on building him a workbench. Last week we just about finished that. Every project is a team effort. Grandpa does some work with the large power tools. Jeremy is a wiz at the drill press, doing glue ups, and using a centering rule, tape measure, clamps and his own tri-square. 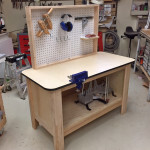 He also used the portable electric drill to drill for and drive the screws for the lower bench shelf. Next project is a tool tote box.